Six years ago, Baltimore, Maryland Complex Manager, Todd Mitchell, decided to create a client event that honored United States veterans and supported his practice as a Financial Advisor. As a retired member of the Armed Forces, he wanted to drive community investment in an area that he was passionate about and where he could make the greatest impact. This idea was the catalyst for the annual veteran’s luncheon. The first year he hosted the event, it was a success. He asked his clients to each bring a veteran to join in the celebration and he honored a veteran of the year. 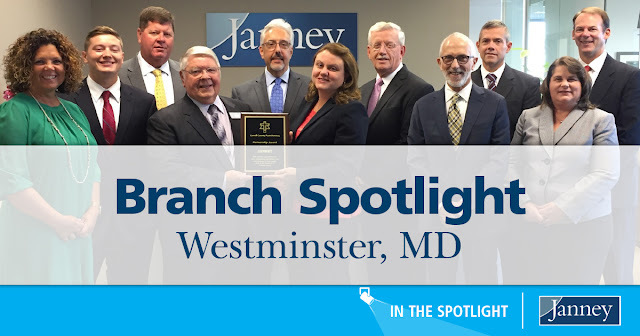 Mitchell wanted to build on the success of this meaningful event and asked his fellow Janney team members at the Westminster branch to participate. Today, the annual veteran’s luncheon has expanded to recognize honorable police officers and first responders in the branch’s local community. With the tireless efforts of the Westminster branch employees, this year’s event surpassed all others. Held on November 8 at the American Legion in Westminster, more than 150 people attended, including the County Commissioner and representatives from the Maryland legislature. The Westminster office distributes letters to local associations and police stations requesting nomination submissions for the annual awards. Mitchell, who also heads the non-profit organization Business Advocates for Veterans, relies on the board of this 501c3 to make the final decision for award recipients. At this year’s event, the Westminster branch honored a police officer of the year, veteran of the year and veteran friendly employer of the year. The inspirational keynote speaker was Sean Jensen, a man who overcame an extremely challenging childhood and became a U.S. Marine. Today, he is a successful author and business owner who employs a team consisting of over 100 employees and nearly 45% of them are veterans. Another honoree and speaker at the 2017 veteran’s luncheon was Gold Star Mom Janice Chance, who lost her son Captain Jesse Melton III in 2008. She was recognized for her service to veterans. In 2017 alone, she volunteered more than 1,100 hours to organizations that support veterans and has driven vets over 11,000 miles to and from hospital visits and appointments. It takes a brave and selfless individual to serve in the Armed Forces. Mitchell and the entire Westminster branch have created a great way for the local community to say thank you and honor the bravery of those who have served.